Mercer Island’s South End neighborhoods are generally considered to be located south of SE 63 rd Street, though the boundary may be a bit further south or north depending on who you talk to. 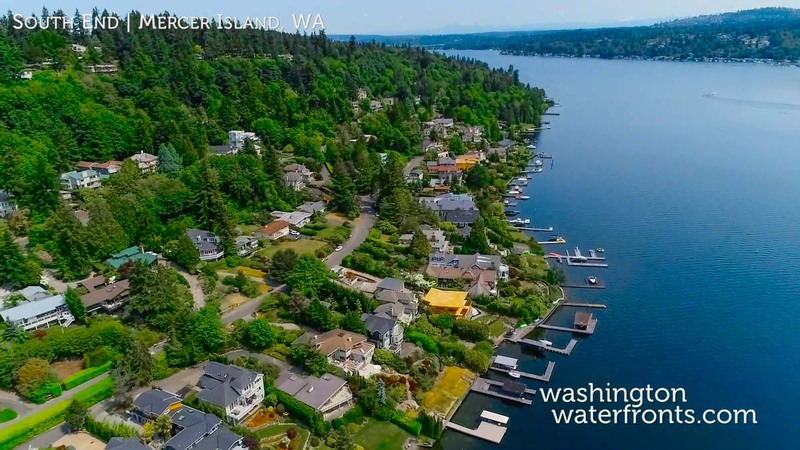 Either way, this area of the island that’s situated in the middle of Lake Washington, linked to Seattle and Bellevue by the I-90 floating bridges, is popular for its secluded feel and striking natural beauty. South End waterfront real estate typically offers some magnificent waterfront estates, at multi-million-dollar prices. Those properties generally include panoramic vistas of Mount Rainier, Seattle, and Lake Washington, with full-on views from inside and out. Many include the requisite private dock, and some homes on the highest end of the spectrum may even feature a seaplane lift. With South End waterfront real estate, you’ll truly be living La Dolce Vita, the sweet life, it’s hard to imagine anything better than this, with everything detailed to perfection. While you’ll have all the recreational opportunities living on the water brings at your doorstep, you won’t be far from urban amenities. The South End hosts its own shopping center, which includes a grocery store, coffee shop, several eateries and other services. Both Seattle and Bellevue are only about a 15- minute drive away, offering endless world-class dining, upscale shopping and entertainment as well as being home to multiple major employers for a short commute to work. South End waterfront real estate owners can also join the Mercer Island Country Club which offers members access to the only local club with indoor and outdoor tennis courts, as well as an eight-lane swimming pool, fitness room, barbecue areas and more. When you want to explore the land, head to Pioneer Park, a favorite local park that boasts over 6.5 miles of trails that wind through 113 acres of natural forest for hiking, and also offers horseback riding trails for riders who belong to the Mercer Island Saddle Club. Take advantage of our industry-leading tools to make your property search as easy as possible and be sure to register for a FREE account so that you can receive email alerts whenever new South End real estate for sale hits the market. If you’re seeking to sell your South End property, contact our Waterfront Specialists directly for a comprehensive listing analysis and to learn more about the cutting-edge marketing strategies we’ll use to sell your home quickly for top dollar!